Wisdom usually entails avoiding extremes by using balancing (“negative”) feedback grounded in observation, relationships, and systems. When abundance or transformation is needed, encourage magnifying (“positive”) feedback. So consciously apply and design feedback dynamics into activities and systems so that nature and reality don’t have to supply them at our expense. What is there too much of in this situation that really needs to be balanced out? What might help with that? What can we set up here that will help us all learn from the results of what we’re doing? What are the positive dynamics here that we could reinforce? What else could we do together to become more aware of how we’re impacting each other and the world around us? Wisdom usually entails avoiding extremes. One of the standard definitions of wisdom is having a sense of balance. In our efforts to create public wisdom and wise democracy we want to create a democracy in which the people can come together and create solutions and systems which don’t go to extremes, solutions and systems which have a certain level of balance and sanity to them. So we want “negative” feedback loops, which means that when there’s a stimulus, the system looks at the stimulus and senses, “Is this too much? Is this too little?” and brings conditions back into balance. The standard example of a negative (“balancing”) feedback dynamic is the thermostat. When the thermostat picks up that the room is too hot, it puts in some cold influence – cold air or whatever the system uses – to balance the heat and the temperature in the room. If the room gets too cold, the thermostat gets the system to pump in some heat. It’s like the rich and poor in society. One of the other patterns in this pattern language tells us to avoid extremes of wealth. People who are very rich can buy more politicians to get more favors and invest their money to accumulate more money. So that is a positive feedback loop that continually increases their wealth and creates imbalances in the society. So having dynamics built into the system to make sure extreme wealth gets balanced out supports long-term benefits for everyone. Progressive taxation is one system that tries to do that. So that’s an example of the dance between negative and positive feedback dynamics. One of the best ways to create rich feedback dynamics is to keep things local. Individual and group actions become known by other people in the area, who then respond. It’s very obvious. You meet people in the grocery store and so on. Those reputational and interactive dynamics are natural aspects of the intimacy of a community or the intimacy of the ecology. If somebody is poisoning things or breaking things down in ways that other people don’t like, that person will hear about it. When things are local the feedback dynamics are much more dense and quick. Once you get up to national and international scales, the feedback loops tend to be more complex, slower operating and less personal and intimate. So that’s one rule: You can make feedback dynamics richer when you have them happen at the local level. Having elections is a way of giving feedback to the government. You can also institute various complaint systems or gratitude systems which generate collective feedback to balancing things out if they start to get a bit too extreme. The whole idea of free speech is an interesting dynamic from a feedback perspective. It can balance things out through people critiquing. Similarly, appreciation and celebration of someone or something can magnify it, which is a positive feedback loop. So if we want to make something larger, we use positive feedback that generates abundance. For example, people in a gifting economy are giving things to each other. They learn what each other needs, and give things that fill those needs. There’s gratitude for that and people begin to build a reputation as being a generous person or an appreciative person. That is all positive feedback and starts to build more participation in the gifting system, causing more gifts to flow which generates a greater sense of abundance within the gifting economy. Transformation is interesting. If you have too much positive feedback, the system can’t manage it. Sometimes people think in terms of positive feedback in audio systems where the sound that is coming out of the speakers is getting fed back into microphones and that feedback cycle makes the sound louder and louder and louder until it totally breaks up the sound system as well as your eardrums unless you stop it. So when there is too much positive feedback things can go out of control. The system is going to break down or shift in one big way or another. So if people are upset with the government and go out in the streets and the government starts to command the police and the military to suppress the protest – which is the people’s feedback – the people get even more unhappy with the government. Suddenly the nonviolent demonstrations become more violent and you start to have sabotage and rebellion: the positive feedback is getting out of control. The system is moving towards a breakdown that is going to look different one way or another. One of the roles of positive feedback is to generate transformation, for better and/or for worse. Usually we want to modify that but sometimes it can’t be modified or you actually want to feed the transformational forces, and you are going to get a major shift. Sometimes positive feedback is to a certain extent built into trends or systems, but it is also used by demagogues or revolutionary movements to magnify forces that serve their interests. This is powerful stuff that demands our attention. We are trying to make the dynamics of systems and of evolving systems conscious. This entails being aware of feedback dynamics, how they are operating, how we want them to operate, what things we want to promote, and what things we want to balance. We are consciously putting in either specific feedback loops or making space where healthy feedback happens more powerfully and naturally just through the self-organized operations of the system as it goes. Systems analysis: Cybernetics is particularly focused on analysis of systems. You can get a lot of understanding by doing systems analysis. 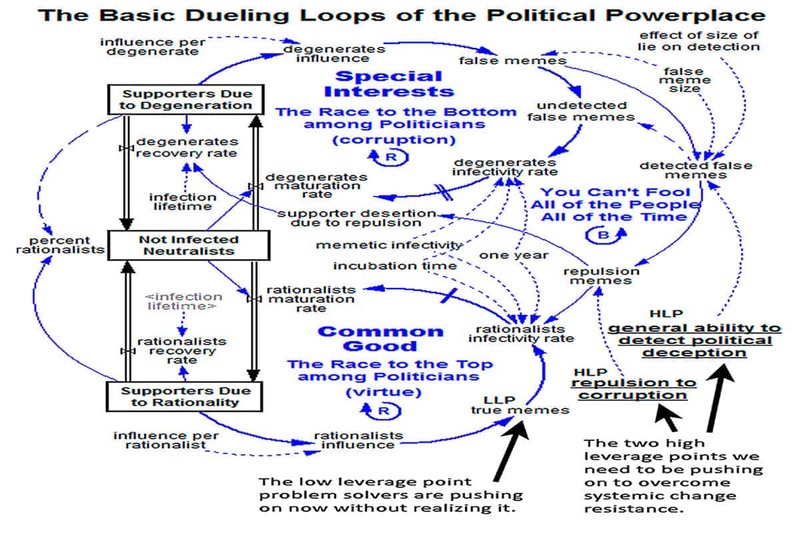 Again it’s analytic, so you’re always going to be missing something, but an awful lot of the major dynamics can be seen just by looking at what’s going on in the system, such as looking how well a social dynamic (like wealth or power) expands or balances out in a particular society. Dynamic Facilitation is an interesting example because in that process the things that people are saying trigger other things that other people support or counter. There’s no suppression of those dynamics. Dynamic Facilitation is called dynamic largely because it is using those energies to produce more rich interactive energy. Whatever situation people are working on, more and more of the dynamics going on in the situation are surfacing through what people are saying and how they’re saying it. And because of the facilitation, slowly the participants are becoming more open to seeing it all, thereby becoming more conscious of the full picture of what’s really going on. As they emerge from their fragmented viewpoints, they get more curious and ultimately more creative together. Dynamic facilitation takes the feedback dynamics of the problem and translates it into generating feedback dynamics for a solution. This is a very intriguing way to look at. Whole-System Stakeholder Dialogues: Again if you have a problem, conflict or issue, the stakeholders involved are collectively generating it and their dynamics are making it more and more of a problem. So by having dialogues where those dynamics are becoming conscious and shared, people can better understand what it is that they’re doing that is generating this common problem, and they can start to become conscious and decide to do something different to generate different feedback dynamics that will generate a healthy resolution. But you need to include people from the whole system – from all parts of the system – in order to have that work really well. If you solve one part of the problem in one corner of the system, some parts in another corner of the system that were not included are going to make themselves known later on, usually in a disturbing way. So it is best to include the whole system up front. Teal Organizations: This is a new concept for organizations that have no bosses. Bosses are usually in place to manage things and to make sure that specific things get done in a sort of top-down way. Teal organizations are mostly organized by self-managed teams. Within each team there is strong communication and strong support going on. Also among teams there are usually strong support and feedback systems set up. If you’re going to do some initiative and there’s no boss to tell you can’t, you need to go around to everybody that will be involved in whatever it is you want to do and get some feedback from them. You say, “Here is what I want to do. What do you have to say about it?” In this way you get quite informed about the larger system before you start impacting certain parts of it. So that creates a very feedback-rich system. Nonviolent Communication: In this process people in conflict tell each other “When you do this I feel this because I need that.” This is actually a description of the feedback dynamics generating interpersonal stress, an inquiry into the stimulus-response dynamics that are generating their conflict. I’m telling you what’s going on in my side of this and finding out from you what’s going on over on your side. That makes the unconscious feedback dynamics of the conflict visible, very much like in Dynamic Facilitation or Whole-System Stakeholder Dialogues. You are making the unconscious feedback dynamics conscious. Then you can say, “Okay, so let’s find some other way to meet our needs so we don’t trigger each other so much and get in each other’s way.“ The process is helping us create feedback dynamics between us that are more mutually supportive and individually satisfying. Repetition Systems: This is iteration. When you do something that triggers a response in the environment, that response tells you what worked or didn’t. If it didn’t work like you wanted, it’s up to you to try something else. Creating systems that have feedback between an idea, its implementation, the results of that, and the understanding of both the action and the feedback – that’s a learning system, that’s an intelligence system. Make sure that you put repetition and iteration into whatever systems you are designing to make feedback systems richer and more conscious and then the whole activity will become more intelligent and able to learn. Stigmergy is a word I learned a couple years ago that refers to an interesting form of feedback that has been studied in ant colonies. One ant will leave a trace of chemicals where it’s been walking and there’s meaning in those chemicals. So you see ants crawling all over the surface in random kind of directions. Then one of them finds the honey jar. So that ant goes back to the colony, leaving chemical traces in its path that indicate there’s food over there. As other ants wander around they stumble upon that message and they start tracking it back and suddenly you have a whole swarm of ants on your honey jar. It turns out that this is very similar to what happens on Amazon.com. When you buy something, Amazon’s algorithm notices that you bought it and notices your other behavior – what you did before you came, what you did while you were on the site and on that particular page and what you did afterwards. It’s doing that for everybody who visits that page and keeping a record of it. That’s the trace: thanks to the algorithm, you are leaving a trace without realizing it. Amazon is collecting your traces (and everyone else’s) and it will then tell you (in a composite way) about all the people who came to the page before you and also looked at that particular page: i.e., they were looking at some other thing, and when they bought this they also bought this other thing with it or they went and looked at this other page. Amazon has all that information on all the people who visited and they give you provocative glimpses of this information to nudge you towards making a purchase – or more purchases. There is nobody there at Amazon figuring it out and telling you. It’s just built into the system and happens automatically. You are leaving your electronic trace just like ants leave their chemical trace. And that’s human technological stigmergy. Those are all examples of where there are rich feedback dynamics, how to install rich feedback dynamics, or how to make feedback dynamics more conscious so that you can have some influence and choice over them.